Another week brings another What’s Up, your weekly look at all things Gears. Here’s What’s Up this week! New Events coming this Spring for Year of The Dog, St Patrick's and more! Our Community Team has grown – Welcome TC Vectes! 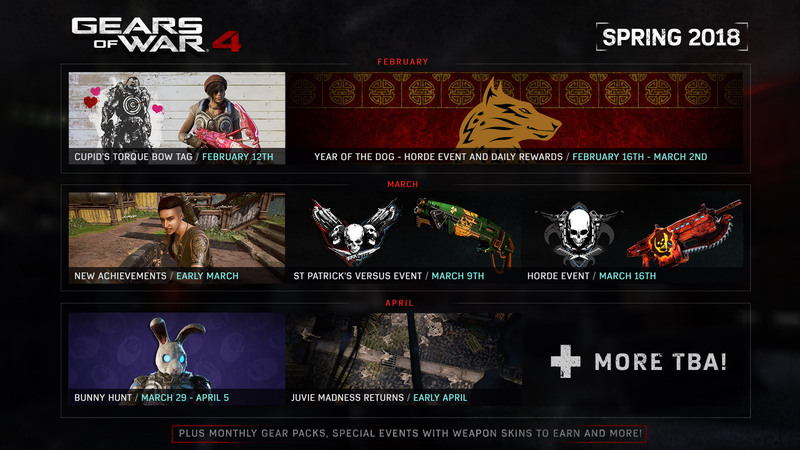 We’ve been filling up the calendar with Gears of War 4 events lately – from Escalation Week to the Midnight Omen Horde Event and, most recently, the return of Blitz. And there’s still PLENTY more to come. EDIT: Cupid's Torque Bow Tag is now live with a Flaming Weapon Challenge! Sign up here. Here’s your first look at The Road Ahead for Gears of War 4 from February to April. Among returning favorites like our Cupid’s Torque Bow Tag, we’ll also have new events including our next ‘Horde Madness’ event for Year of the Dog and a special Versus game mode for St Patrick’s Day! Stay tuned for more details as we get closer to each event. 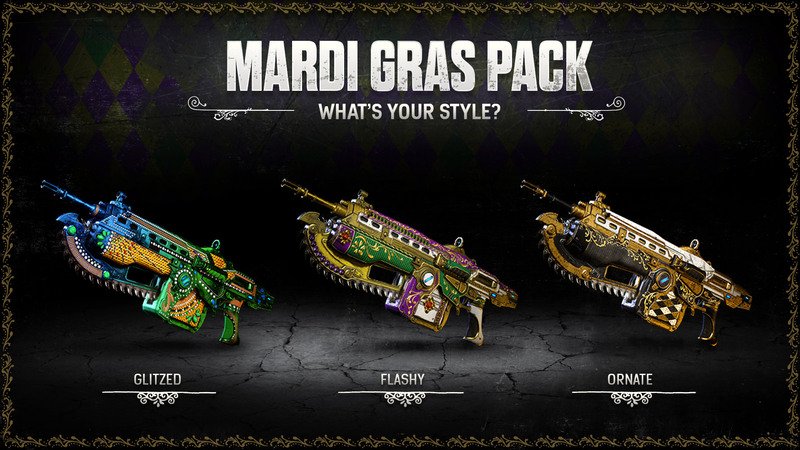 Celebrate Mardi Gras with a new Weapon Skin Gear Pack filled with 3 different weapon skin sets themed to major celebrations happening around the world! Whether you're all about the Ornate Venetian look or you want a boatload of Brazilian flair with Glitzed, we've got it covered. Collect all three sets for one week beginning Friday, February 9th for 400 Credits. The Winter Olympics begin this Friday, and we're getting (slightly in the spirit) with our February Series 3 drop! 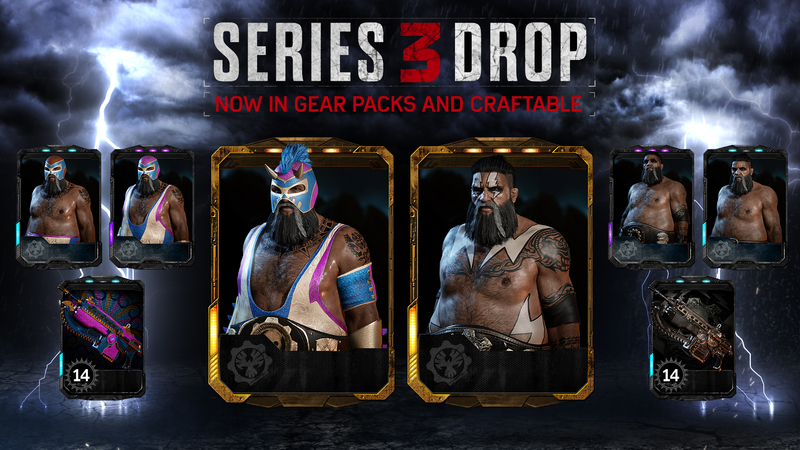 Beginning on Friday, February 9th, the entire Wrestler Oscar and Luchador Oscar collection (except Emblems) will become Craftable in Gears of War 4. As always, Series 3 content can also be found in any Gear Pack once added to the Series. Community is an integral part of the culture at The Coalition. Last year, we posted an update about our commitment to improving the way we interact with our fans – from regular community updates to increased transparency and more responsiveness. To achieve those goals to the level we – and you – expect, we needed to expand the team to include a second Community Manager. Today, we’re excited to announce the newest addition to the Community Team – TC Vectes! I am Vectes, your new Community Manager, joining Octus and Dana. I have been a fan of the Gears of War franchise since the first game. Gears made me buy a HDTV shortly after I got my Xbox 360. My favorite character is Dom – he is the kind of guy you would like to call a friend, I like his sense of humor, his strong loyalty to Marcus and Delta Squad, proven by his ultimate sacrifice. I have been working in the games industry for 10 years across different games and publishers and it is an honor for me to be back at Microsoft, to finally step inside a game studio, and to work on one of my most favorite shooters of all time. So now that you know a bit more about me, the question that you all have: what is going to be my relationship with you? As Octus mentioned in this thread back in October last year, me joining the team is all about our commitment to increase the transparency and frequency of conversation with our fans. This is why I will be focusing on being out there among you as much as possible, whether that’s on the forums, Reddit, Facebook, Twitter or Mixer. I will be acting as a messenger between you and the dev team, so look for me. But let’s be clear – I cannot give you River. You will find me on the forums and Xbox Live as TC Vectes and I will connect with you through the @CoalitionGears Twitter account for all support issues. Octus and I will oversee the @GearsofWar account. I will see you online. You’ll see more from Vectes via @CoalitionGears, on the forums, Reddit and a whole bunch of other places – including our Weekly Live Streams. Speaking of which, make sure you tune in to our stream at 3pm PDT tomorrow for your chance to get to know Vectes! This Week in Esports, the journey to collect the latest Phantom Esports Weapon Skin set got underway! 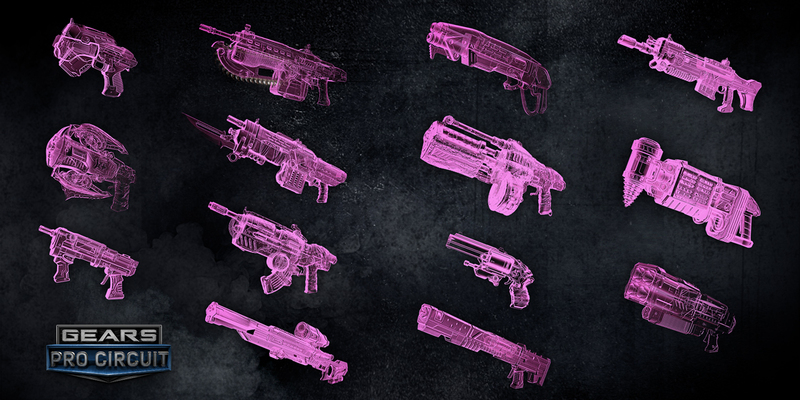 Pink Phantom is the latest set on offer (shown above) - find out how to earn each weapon in the set in the official announcement post here. Also in the world of Esports this week, the latest episode of the Gears Pro Circuit All Access aired live on Mixer! Taking you behind the scenes of the recent Mexico City Open, this episode gives you an veil-lifting look at what it means to compete in Gears Esports - from the emotions to the tactics, the fustrations of a hard loss and the elation of a major win. Don't miss this! Last week, we put three of the best clips from the Pros at the Mexico City Open up against three of the best fan clips from Escalation as we asked you – who played it better? You’ve spoken and THE FANS took home the win with 68% of the votes! Now our fans are getting the spotlight again with our latest video competition. For this week’s Museum of Community Glory, we asked you for your best Blitz clips from our latest special event. Here’s the Blitz clip of the week from fan Mills! Next week, it’s all about Fan Art! Submit your Fan Art for the chance to be featured in our official Weekly Submission thread, or tweet @CoalitionGears with hashtag #WhatsUpGears. We’ll feature our favorite three in next week’s MOCG. Gearsmas Weapon Skins plus fixed Thankgibbing and Flaming Snub Rewards have rolled out. Season 2 Rewards coming soon. Beginning on Friday, the Map Rotation will be updated to make all map probabilities equal and remove some non-Pro Circuit maps (or potential future maps) from Competitive. Kill Trading in Core is being discussed at the studio. Updates should come in the near future. We are banning any Windows 10 hackers or cheaters within days, and escalating repeat offenders for platform-level action. We are continuing to work with our partners to get two notable Windows 10 issues resolved as soon as possible. Two known workarounds are posted here. That’s it from us this week. See you next week for the first details on the Year of the Dog event to celebrate the arrival of the Chinese New Year.